Keep on rockin' out with these games that, like, totally get it, man! Plenty of different genres can flourish on iOS devices, and we've seen shining examples of each across the years: FPS, RTS, fighting, and even adventure games. We're at a point where we're seeing exemplary titles found scattered throughout the App Store that some consumers may not have even heard of yet -- there's so many options out there, it can be difficult to find the diamonds in the rough. We've scoured the App Store for the very best ways to get your groove on while on the move. Forget unrolling an unwieldy dance mat or fiddling around with pricey peripherals -- you've got the power of your favorite music games in your pocket. With that, we present the best iOS music games currently available. Like Flash Flash Revolution before it and the indomitable DDR (where it all started), Tap Tap Radiation offers an outlet through which you can tap your favorite songs to your heart's content. Tapulous is responsible for music games on the App Store that consistently knock it out of the park, so it's not a surprise that Radiation only expands upon an already great formula. Rather than adopting Guitar Hero-like lanes that work like Tap Tap Revenge, Radiation works more like an interactive soundscape that sends gorgeous fireworks exploding across the screen. It comes packing 30 songs to get you started with a very agreeable price point of $2.99 per song pack, so there's going to be tons of content to tide you over. 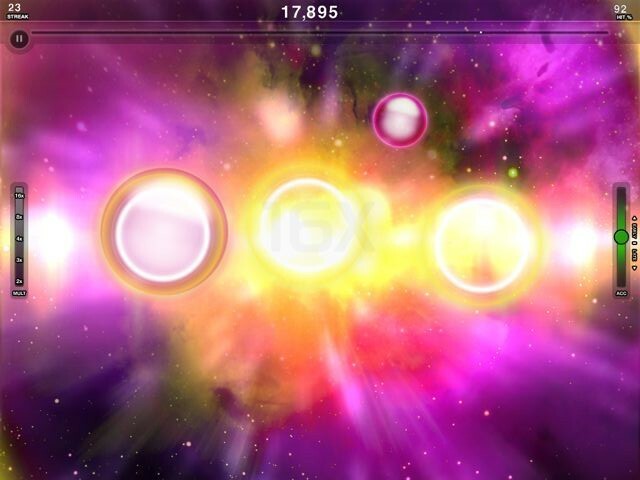 By far one of the best-looking games on the list, Tap Tap Radiation is an excellent rhythm game. Download Tap Tap Radiation from the App Store. Chances are, you've probably already been enjoying this deceptively simple social app. It's chock-full of different genres of music for you to test your (hopefully) encyclopedic kowledge of song trivia. It's simple -- you choose a genre and you're randomly matched with an opponent in order to test your skills. The object is to be the quickest to identify all songs in a set. High-quality clips will play in succession and you need lightning-fast reflexes to score higher and win miniature match-ups. The app is free if you go with the Lite version, and you can quickly unlock new song packs. It's extremely easy to find others to play with, as well. Plus, it gives you an excuse to have cheesy '80s tunes blaring from your phone. Download SongPop from the App Store. Taito threw their hat into the ring with Groove Coaster, a gorgeous and inventive rhythm game with the rare ability to make every song played feel like a new and unique experience. Including thumping beats and remixed Space Invaders and Arkanoid tunes as well as a varied soundtrack, Groove Coaster managed to find a fantastic way to represent each tune in a visual manner. Retro-futuristic graphics and three different levels of difficulty ensure you're glued to the screen at all times, and who wouldn't be? The only thing it's missing is the ability to import songs, but with such a varied library, you won't be worrying about that for long. Download Groove Coaster from the App Store.